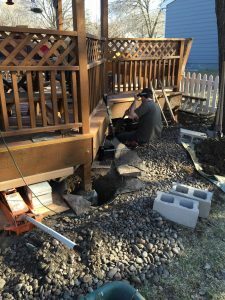 Associated Siding and Remodeling Has Been Building Decks Built to Last for home owners in the Omaha NE And Council Bluffs IA For Over 40 Years in fact its been 41 Years. From Building Decks out of Cedar Wood or for a maintenance free Deck Armadillo Decks the choice is Yours. (We are a Certified Builder for Armadillo Decks) We Make Decks Built to Last. 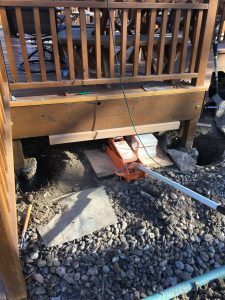 Your cedar deck needs the proper footings for support. 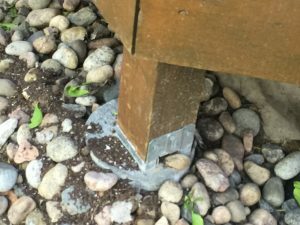 25 years ago I was building my red cedar deck and I was advised (building code at the time) to dig hole’s for the footings 43″ deep put rocks in the bottom of the hole drop the 4×4″ Cedar Post in the hole, level the post and pour cement in the hole. The rocks in the bottom of the hole would let water drain out and not trap the water like cement would. Since I was building a heavy deck cover with a roof I wanted the posts i the ground for stability. This system worked for 25 years. Then the deck started to sink. 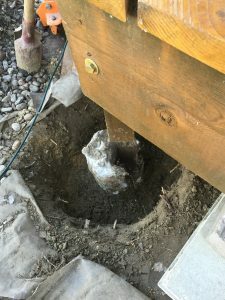 After much agonizing, planning and fear of raising the heavy structure that could topple over when we cut the bottom of the posts, We had the deck suspended on jacks while we poured the new footings up to the bottom of the new post brackets and we got it done! When we jacked up the deck and roof cover the 4×4″s pulled up out of the holes they left in the footings. We raised the deck about 10 inches with bottle jacks and a car jack. Inside the old footings where the 4×4″ cedar posts were, was now just dirt where the wood had disappeared. Burying the deck posts in the ground is a bad idea. In 2015 they have nice post brackets that can be used to anchor your posts and Keep them out of the Dirt. Today’s Building code in the Omaha Metro Area is No cedar in the ground, Treated Lumber is O K to bury. We keep ’em both off the ground so they don’t decay. The beauty of a Red Cedar Deck is that they still make red cedar just like 25 Years Ago the cut sizes that is and you can still get it to match if you are just replacing the deck floor and floor Joists, or just one piece of wood. If the railing and posts and deck cover are Still in Good Shape and they don’t need to be replaced. So we can Just fix (deck Repair) the bad pieces and stain everything to match and it works great. With composite Decking, The color, texture size, and material availability are going to change over time making it sometimes difficult or impossible to repair or replace or add on to your composite deck. Sometimes the manufacturers discontinue colors and entire product Lines. Mother Nature makes cedar and she seems to be set in her ways. Staining and sealing a Cedar Deck may not be for you. That’s why composite decking is so popular. We would be happy to build you any kind of deck you decide you Want and we will use a support system that Will last a long time.